Sixteen teams will enter, but only one will get the chance to skate with Lord Stanley’s Cup. 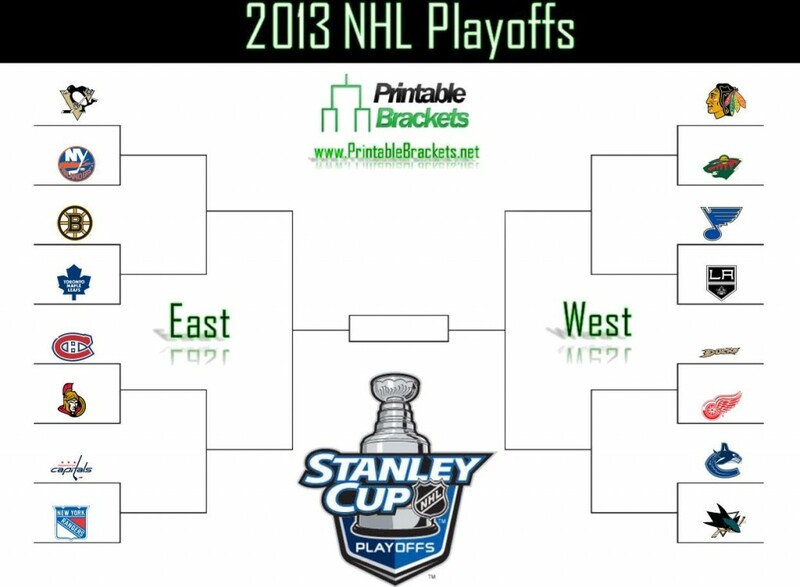 The 2013 NHL Playoffs will get underway on Tuesday, April 30th. The last possible date for a Game Seven of the Stanley Cup Final lands on June 28th. 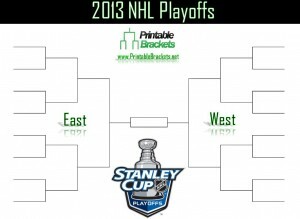 Hockey fans can follow all the action with an NHL Playoffs 2013 bracket. This bracket sheet is also ideal for setting up a pool at the office. The Stanley Cup was first awarded to the Montreal Hockey Club of the Amateur Hockey Association of Canada in March 1893. Later, the NHL shared ownership of the Stanley Cup with the Pacific Coast Hockey Association. However, the NHL took full control of the cup in 1926. In the first year the year the NHL had full ownership of the cup, the Ottawa Senators knocked off the Boston Bruins in the final in 1927. No team has raised the most recognized trophy in all of sports during the Stanley Cup era more than the Montreal Canadiens. The “Habs” have appeared in the Stanley Cup Final 34 times and come out with the title 24 times. Montreal won the cup for the first time in 1916. The Toronto Maple Leafs are second on the all-time list with 13 titles. The Detroit Red Wings are third with 11 championships. The Wings have also lost in the Final a record 13 times. The 2013 NHL Playoffs nearly didn’t happen at all due to the NHL lockout. The labor dispute between the league and the players began when the collective bargaining agreement expired on September 15th, 2012. The lockout lasted all the way until January 2013. The lockout forced the cancellation of over 500 regular season games. Each team’s schedule was also reduced from 82 to 48 games. The 2013 season began with a bang as the Chicago Blackhawks opened the year with at least a point in their first 30 games. The defending champion entering the 2013 NHL playoffs is the Los Angeles Kings, who dispatched of the New Jersey Devils in six games to win the cup for the first time in franchise history in 2012.